A traditional ruler in Ise Town, Ibeju Lekki, Lagos State, Taibu Ogunbanjo, is currently cooling his heels in police custody for allegedly crushing his wife to death. The baale runs a block-moulding factory at Folu, a community in Ibeju Lekki. learnt that Taibu and his wife, Rotimi Ogunbanjo, got married three years ago, but the marriage had been fraught with misunderstanding and fights. On Thursday, December 7, the couple reportedly had a disagreement. After the altercation, Rotimi was said to have gone to the baale’s factory and damaged some blocks on the premises. Taibu reportedly entered his Toyota Highlander, and was driving out of the premises in anger when he knocked down his wife. A community leader, who identified himself simply as Akinsipe, said the wife died on the spot, adding that the corpse had been deposited at the Epe General Hospital. He said, “He (Taibu) is the baale of the community. He and his wife had been having issues since they got married. I did not know what actually happened between them on that day, but I learnt that they had a disagreement in the morning. Akinsipe stated that the matter was reported at the Akodo Police Station, adding that the baale had been arrested. A police source told Punch that the suspect’s family reported at the police station that the death resulted from an accident. The source said, “The baale and the woman got married three years ago without a child and they had been having disagreements. On that particular day, she destroyed some blocks at the industry. The man became angry and as he was driving out, he crushed her with his vehicle on the factory premises. “The relations of the suspect have said that it was a case of an accident. But looking at the circumstances surrounding the incident, the accident claim is untenable. Lagos Police Public Relations Officer, SP Chike Oti, who confirmed Rotimi’s death, said the command would investigate the matter to unravel the motive behind the baale’s action. He said, “We are investigating the matter to find out what transpired between the man and his wife before the incident happened. They were having family issues, which led the woman to the block industry to destroy things. 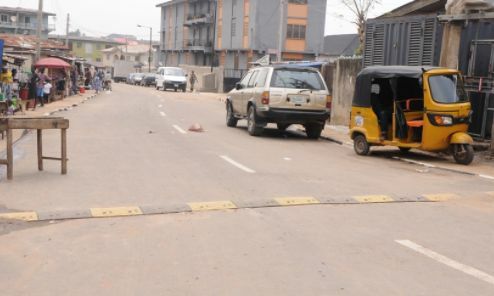 The PPRO added that the case had been transferred to the Homicide Section of the State Criminal Investigation and Intelligence Department, Yaba.